In this post you will learn what is chromecast and how does chromecast work. Google chromecast is a device developed by Google which can stream directly video or audio on your HDTV or your audio system from internet. You can control it remotely by your computer or smartphone. We can easily stream video from YouTube, google play store, HuluPlus , Netflix etc by chromecast. You can also display content from chrome browser to HD TV screen. It supports iPhone, Android phone, tablets, iPad, Mac and Windows laptops and chrome book. The first generation chromecast was of 2.83 inches in length with an HDMI plug attached with it. 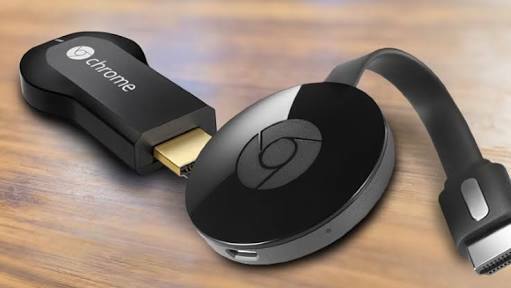 The second generation chromecast came with a puck like shape with a small HDMI cable attached. 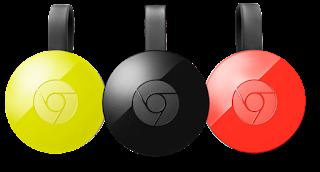 The latest version of chromecast has come in three different colors - dubbed black, lemonade, and coral. Latest version has higher video resolution and less buffeting. Its Wi-Fi performance has improved. (Dual band 2.4 and 5GHz support and it supports for 802.11 ac). In this version, we can mirror any tab from the chrome browser to the TV. How does chromecast work ? Google chromecast has a simple version of Google's chrome OS, it contains only 256 mb of memory. Actually, it doesn't need a lot of memory because it acts as only a passage between your Wi-Fi and HDTV. Now, we have to cast content to the chromecast app on your smartphone or your computer. When you will insert the information regarding your choice of video or audio, the chromecast will start to search the material from the internet. After finding it on internet, it will start streaming it. In this way, streaming task is done by the chromecast, so the battery of mobile will not spend much. But, when you will mirror your chrome browser then chromecast will depend on the computer for the source of what it displays. When chromecast was launched, it supported only few apps. But, as time passed, scenario changed completely. Now, chromecast supports more than 300 apps and interesting thing is that each day no is increasing. Some of the popular apps compatible with chromecast are Google cast, YouTube, Netflix,All Cast, vudu and Crackle, Showtime and Showtime Anytime, WatchEspn, Sling TV, Spotify, Pandora, chrome etc.